The tall sedums (as opposed to the groundcover stonecrop varieties) have received marked attention from plant breeders over the past twenty years, resulting in quite a number of fabulous, showy perennials that will make your earlier, less than joyous experience with ‘Autumn Joy’ a vague memory. When I started gardening, ‘Autumn Joy’ was it. If you had a tall sedum in your garden, it was Joy. Though the leaves were a bit different – broad, lobed, and fleshy – the entire plant was plain green, with a great propensity for flopping over once the late-season, heavy clusters of pinkish-red flowers gained weight under August skies. ‘Cherry Tart’ – Low-growing, mounded foliage is tinted cherry pink. Clusters of pink flowers emerge August – September. 6” H x 18” W. Zone 4. ‘Cherry Truffle’ – Very striking, bi-color purplish and gray-green leaves emerge in spring, turning deep purple in summer. Deep pink flowers August – September. 16” H x 24” W. Zone 4. ‘Mr. 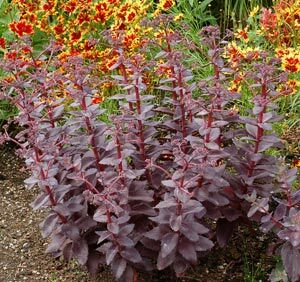 Goodbud’ – Someone having a little too much fun naming this one, but it’s fab, purple-red stems holding serrated, blue-green foliage. Pink flower clusters August – September. 16” H x 18” W. Zone 3. ‘Purple Emporer’ – Dark purple, extra fleshy leaves on compact purple stems. Pink-purple seedheads August – September. 16” H x 18” W. Zone 3. ‘Xenox’ – Dusky blue-green foliage matures to burgundy for summer and fall, and offers nice contrast to the rose-pink flowers. You guessed it, August – September. My favorite of the newer sedums. Better plant than ‘Black Jack.” 16” H x 18” W. Zone 3. All these new upright varieties feature stouter, stronger stems than the Joyous sedums of old. 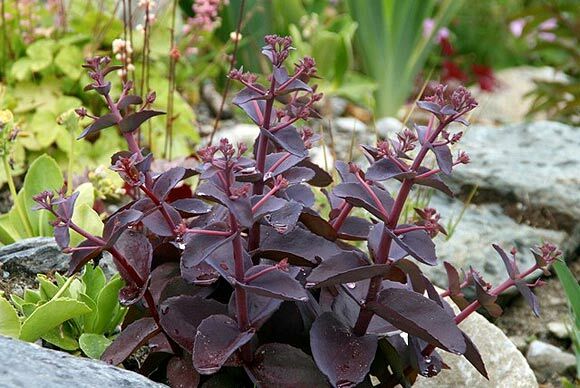 Sedums thrive in full sun but will perform well in part shade, though to fine-tune that a bit, finding at least five hours of direct sunlight is necessary. Planted thus and in halfway decent soil, sedums are very low-maintenance perennials not prone to insect or fungal damage. I wouldn’t call them deer magnets, but deer have acquired a taste. Not the first thing they’ll eat, though. Sedums are great at the front of the perennial border, and can be used as singles or in odd-number groups. Their strong foliage hues are their asset, so plant them next to something with contrasting foliage color. Sedums also look great planted in the sunny spots amid tree and shrub borders. There is a heft to them caused by the thick stems, succulent leaves and large flower mops that few perennials of similar height can match. Sedums can handle a wide range of soil types, but will grow largest and most robustly in soil that is well amended with organic material. Soil should have adequate drainage, but should not be allowed to dry out. Give sedums a good stiff drink once a week, a bit more often in peak heat and drought conditions.